Piecing the required 236 blocks was a breeze, connecting all those blocks took me forever. For some reason I could only stand the monotony for a couple of hours a day. I'm good when it comes to piecing blocks, the variety in the fabric and pieces keeps me engaged. I had no idea I had such a low tolerance for repetitive piecing until I tackled this pattern. It's interesting what you learn about yourself, even after 10 years of sewing. Although I never did get tired of looking at that Sanibel fabric. 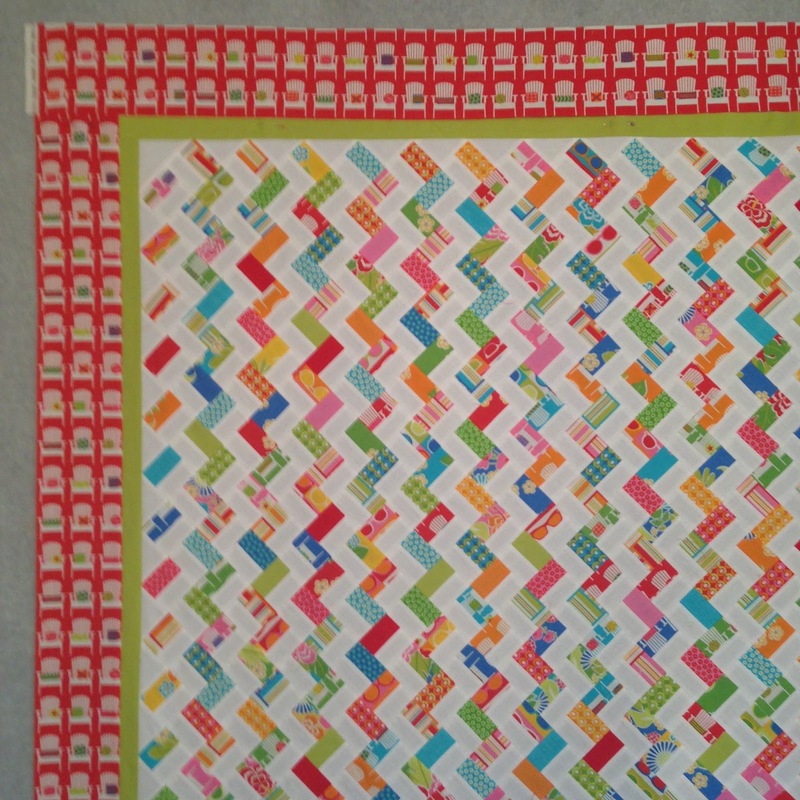 So here is Short Line with the blocks pieced, all it needed was a border. I thought I was on the home stretch. 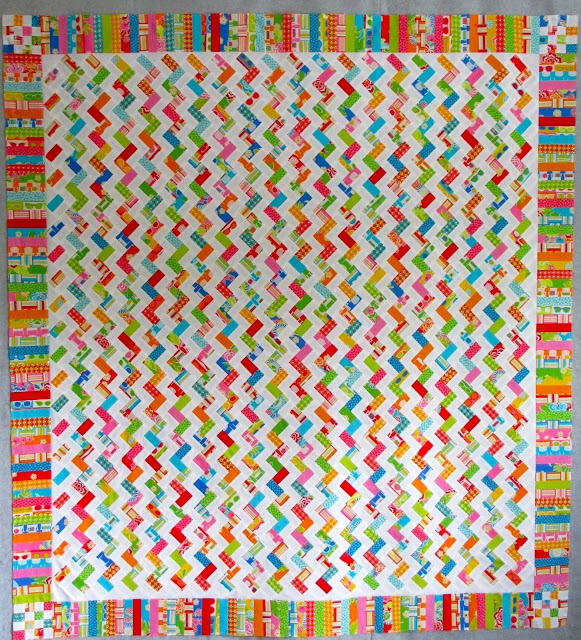 Then a funny thing happened, the fabric I selected for the border, the fabric I loved and couldn't wait to use, my most favorite fabric in the whole bundle, it didn't look so good once it was on the quilt. I'm not even sure why. I thought the smaller strips would play great with the smaller print of that border, but I was wrong. I wish I could understand why it looks bad, all I know is that it does not appeal to me. Well I loved that red beach chair fabric so much I wasn't willing to give it up easily, and tried this. I took off the green inner border and separated the chairs with white fabric. I didn't like this either. 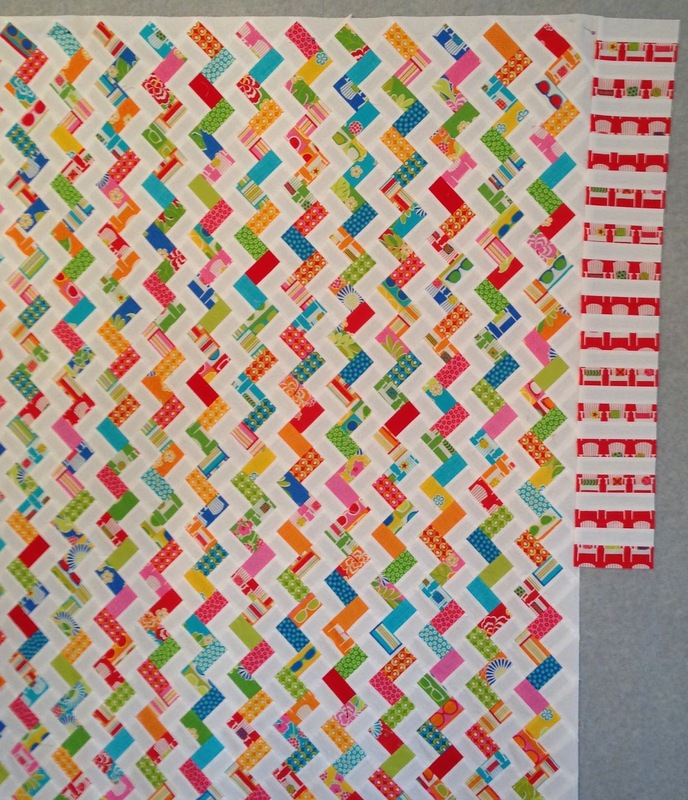 Then I tried a third option, large scrappy strips of the fabric for a border. It looked bad too, and I forgot to take a picture, but it wasn't up on the design wall for long. Then I decided to go with the border that was used in the pattern, and all turned out well. 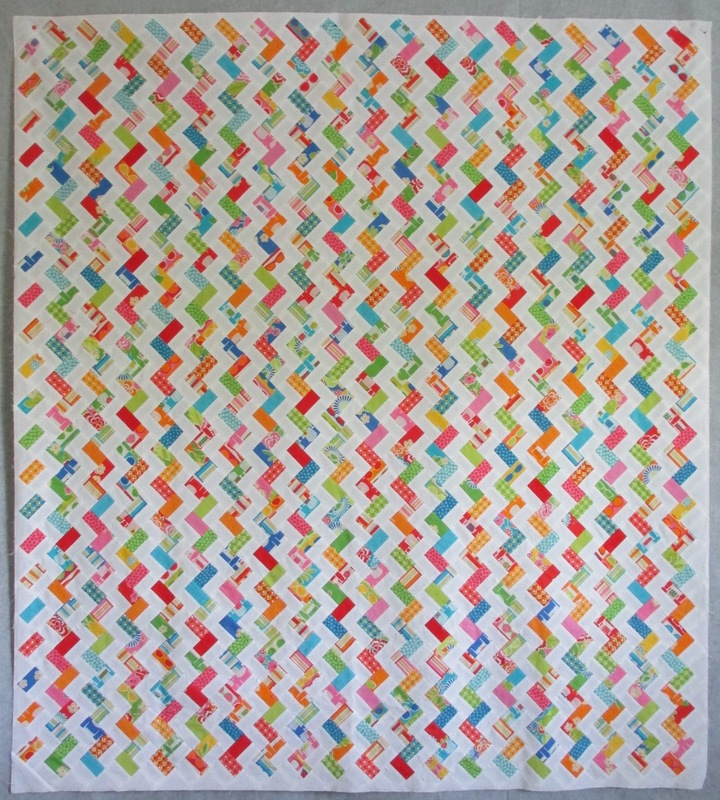 The pattern is Short Line by Miss Rosie's Quilt Co. 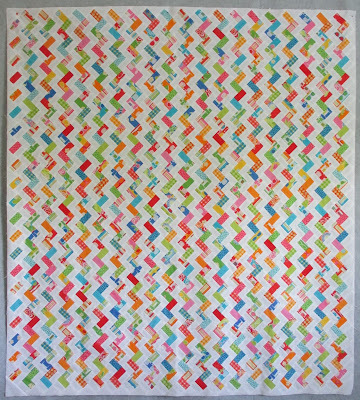 It finished at 65" x 72"
It has approximately 2,054 pieces. I love this fabric so much I I'm going use of my scraps on the back. 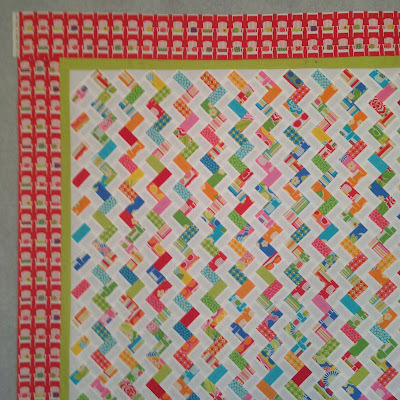 Miss Rosie's Quilt Co patterns are sometimes hard to find right now, The Corn Wagon Quilt Shop currently has Short Line patterns in stock. I enjoyed seeing how the various options looked. I was amazed at how I thought I really liked the chairs, only to realize that the border you ended up with was perfect! 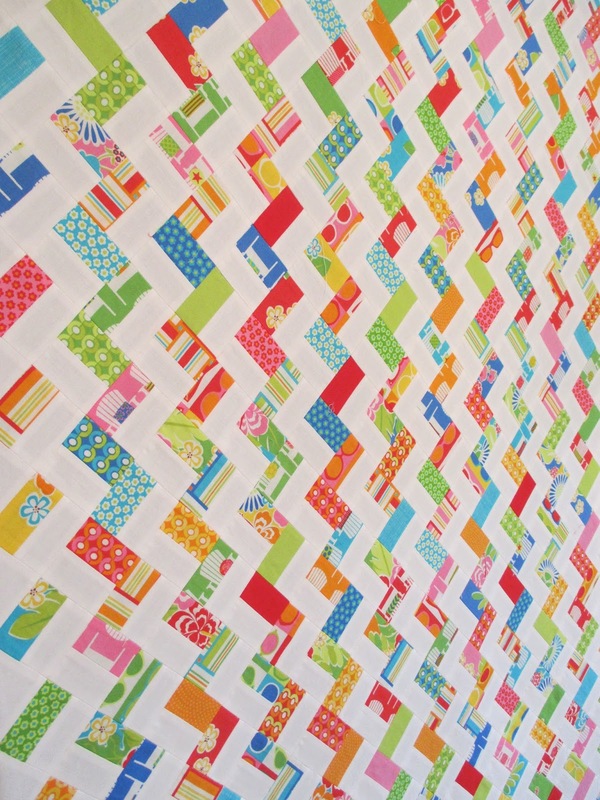 Such a fresh and lovely quilt! I've made a couple of quilts that started with a starring border fabric and in the end the fabric looked horrible on the quilt. Thanks for sharing the process. The end result is a big winner! I have discovered that sometimes a scrappy border (or setting squares) is just what a busy quilt needs. You would think that was counter intuitive! Your Shortline turned out magnificently. 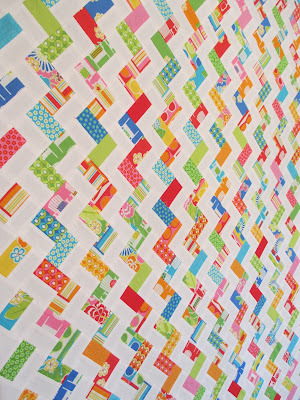 GORGEOUS quilt Thelma!! I absolutely love the bright citrusy colors paired with the white! 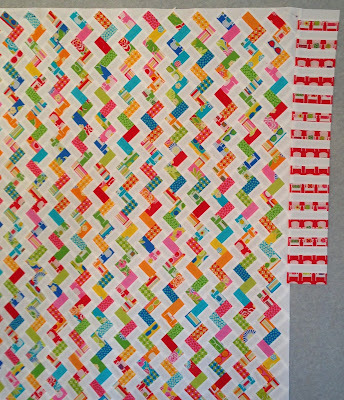 Gorgeous quilt and beautiful border choice! The border really makes a finish for you top and great choice.....love it! Just love this quilt! Gorgeous! I love your final choice for the border, it is perfect! What an adorable quilt!